Buy Stone Age and PriceWatch, Buy this board game at the Lowest Price. Stone Age is one of those games that is so much fun to play once you get into the swing of things that you won't mind the time you invested learning the rules, or that this game can take a little longer than many others to wrap up. The artwork is very nicely rendered, the pieces are fun to play with, and the theme is delightful. Stone Age successfully meshes a strong theme with interesting game mechanics, giving the sense that neither has undue emphasis. And Stone Age is simply a lot of fun to play! There are interesting little pieces to collect and numerous decisions to make each turn, but the flow of the game keeps things moving at a good pace. The first time I played I found myself an hour and a half into the game, just enjoying the process and not really caring that it was so late or even who was winning. The strategy has a light feeling to it, but actually runs deep. There are many paths to victory and enough chance (provided by dice) that there isn't really any deep strategic analysis to slow things down. Yet, the player who can recognize and seize opportunities effectively can utilize skill to overcome luck quite easily. You certainly don't get the feeling that the winner was chosen randomly; this is definitely a strategy game, just one that forces you to constantly reevaluate your approach. 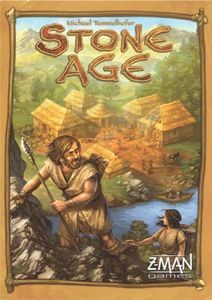 In Stone Age, players simply try to advance their civilizations by gathering raw materials, constructing buildings, gathering cards of specific worker types, and hunting and growing food. This process involves managing scarce resources and limited move possibilities, and reacting to other players' moves. Two "family" members can bring a baby into the fold, and feeding all the hungry mouths becomes more and more challenging, unless you focus your efforts on farming, which can become self-sustaining. Another great aspect of this game is that all players are active nearly all the time. Rather than long single-player turns, the game proceeds in rounds with each player taking turns being the first to choose among many options, but each player getting a choice during every round. This keeps all players engaged and thinking, yet the pace of the game seems to move steadily onward. Supporting two to four players, ages 10 and up, this is a great game for couples or families. The theme is sure to delight young and old and there is enough variety in strategic options to keep this game interesting for a long time. We love Stone Age and give it our highest recommendation, as our winner of the Best Strategy Game award for 2008.